Introductory note: I wanted the first words on this year’s Common Reader to come from the former student and Sigma Tau Delta member who first introduced me to this remarkable novel. 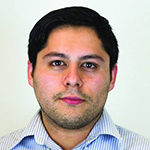 Jose Alfredo Anaya graduated from Fort Hays State University in 2015 and is now an English Language Arts teacher and yearbook advisor in his hometown of Liberal, KS. As a first-generation Hispanic immigrant, I have always looked for representation of my Latin culture in the media. It’s often overlooked in movies, TV shows, and different aspects of mainstream “American” pop culture. However, every once in a while I am lucky enough to find meaningful representations within novels or articles written by Latinx authors. This was definitely the case when I began reading the novel The Book of Unknown Americans by Cristina Henríquez. 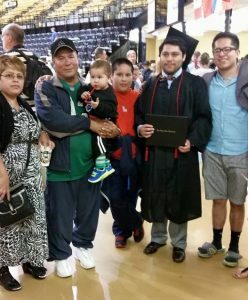 Anaya’s family celebrates his graduation from Fort Hays State University. Henríquez’s novel focuses on the experience of a family coming to the United States for the first time, which resonates with my experience, as I remember my parents bringing me to this country when I was five years old. Like the Rivera family in the novel, my parents hoped to provide my sister and me with better opportunities in this country. The parents in the novel, Alma and Arturo Rivera, left their home country of Mexico and their comfortable lifestyle in order to help provide special treatment and an education for their daughter, Maribel, who had suffered a head injury. There’s a particular scene in the novel where Mrs. Rivera and a neighbor are having a conversation about the differences in “American” versions of salsa and tortillas and how bland they are compared to the authentic food they are used to eating. This scene stood out to me because cuisine is a big part of the Latinx culture, but finding a new identity to it is part of the experience of being an immigrant in the United States. It’s also comforting to know that the United States has accepted tortillas and salsa as part of its own identity. Throughout the novel the Rivera family learns about the different experiences of many different immigrants in their apartment building. There are families from Mexico, Panama, Puerto Rico, Paraguay, and Nicaragua. Some of the challenges that these different characters share with the Rivera family are complex and relatable, especially in our modern day society. Mr. Toro, a neighbor, mentions his fear of driving stems from being profiled by his skin color. He says, “If you’re black, if you’re brown, they automatically think you’ve done something wrong” (166). Despite living in the country legally, and generally being a very cautious driver (even extremely cautious, to his wife’s annoyance), he is still fearful of being treated unfairly because of his background. In our current society any Latinx or person of color can relate to this fear on some level. My favorite aspect of the novel is how honest the experiences of the characters are. In a very carefully crafted manner, Henríquez makes it so the characters are easy to connect to and understand on an emotional level. By making their experiences, fears, and challenges authentic, Henríquez creates characters that we can really believe could be our neighbors and community members, and she helps create empathy and understanding of those characters. The novel’s title itself highlights how groups of people different than we are are often overlooked. The characters in the novel are not “unknown” Americans because they choose to live secret lives or hide away from society because of legal status or documentation, but because people who are prejudiced or opposed to Latinx immigrants would rather feel like they are unknown or different to them. It is easier to hate others when we only focus on differences. 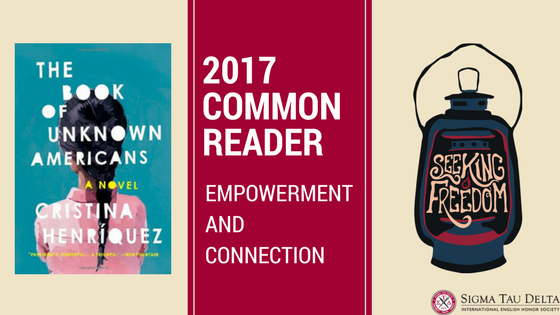 The Book of Unknown Americans will spark a sense of empathy and a deeper understanding not just for Latinx immigrants, but for many of those that we consider different from ourselves. Representation in the media is important, especially for groups of people that are often ignored. Accurate representations, however, help make the difference for those of us that are part of those groups to feel like we have common experiences and have overcome similar struggles. I would strongly recommend this novel to anyone. It will help readers learn something about other cultures, or themselves, in a heartfelt way, and it reminds us all that we are a nation of immigrants. And now more than ever it is up to us to be open to learning about those that are “unknown” to us in order to foster a community of acceptance and support for those who may be ignored by our own biased perceptions.